If you've seen the full trailer for the new Godzilla, you know it's pretty amazing. It also doesn't reveal a whole lot about the movie. Fortunately, director Gareth Edwards was willing to do commentary for Empire on the trailer. His insights are fascinating, not only breaking down the trailer and what we're seeing, but also giving insights into the movie itself. It's like the movie commentary in miniature. And the bonus is that there are no spoilers. The Statue of Liberty Is Not In New York - If you look closely, you can see sand and a roller coaster in the background. Edwards was hesitant to spoil it, but fans have already figured out this shot isn't of the statue in New York. It's the replica Statue of Liberty in Las Vegas. Bryan Cranston is The Man - Edwards also breaks down the scene where Cranston utters the immortal line, "It is gonna send us back to the Stone Age!" Edwards explains how he set up a complex and elaborate camera move, and intricate movement for that scene, and Cranston nailed the first take so well that Edwards abandoned his plans and left it in. Once again, Cranston shows he's still got chops, even after Breaking Bad. Just makes me more disappointed that he didn't get cast as Lex Luthor in Man of Steel 2. The New Godzilla Pays Home to the Old Godzilla - Edwards talks about how Ken Watanabe describes awakening something in 1954. Edwards announced on set that they had just witnessed cinema history. What he's referencing is that fact that the original Godzilla was released in 1954. That places the creation of the new Godzilla on the same date as the old one. Godzilla-Busters - Edwards describes how the icon on the bomb is a reference to how soldiers often write or draw funny images on bombs before launch. In this case, the soldiers drew a sort of Ghostbusters-style icon of Godzilla on the bomb, showing it was intended to destroy the monster. 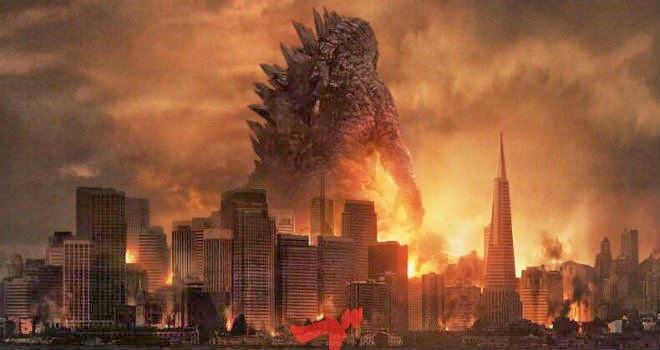 According to Edwards, in the new Godzilla universe, the "nuclear testing" in the Pacific during the fifties were actually attempts to destroy Godzilla. Apparently, this was part of his original pitch to the studio which got him the job. The Song from 2001 - One piece of music from the trailer is an excerpt from György Ligeti's Requiem. If it sounds familiar, it's because the same excerpt was used in 2001: A Space Odyssey when the monolith first appears. Edwards was apparently listening to the song on his phone when he conceived the HALO jump sequence. This is Not a Tentacle - While there's been much speculation as to what this is, Edwards specifically stated it's not a tentacle holding the bomb. Sure looks like one, though. I don't know what else it could be. The Giant Skeleton - At one point, we see an enormous skeleton. While Edwards dodges around the facts behind it, he does say he wanted to ground Godzilla in reality, and ask questions about where it came from. Were there others of Godzilla's kind? If so, where are they and where did they go? 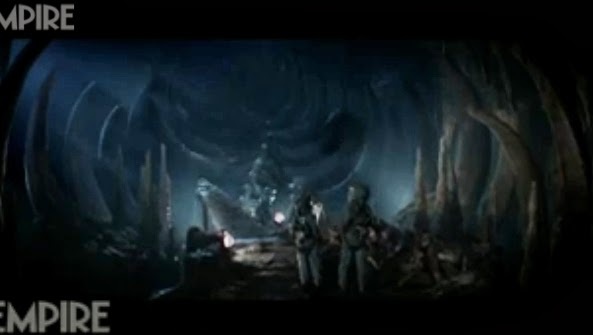 It sounds to me like this scene is a sort of kaiju graveyard where we see the remains of other giant monsters, similar to the giant ape graveyard in Peter Jackson's King Kong. The Roar - The original Godzilla roar is iconic. Edwards explained how the original roar was created with double base strings dragged by a leather glove. I kind of assumed they would just use the same roar again in the new movie, but the sound effects crew for the new movie had to recreate that roar in full Dolby sound. And it's awesome. What do you think of the trailer? What did you like about the commentary? The symbol on the bomb was what I figured. Clearly a movie that is heavy on Godzilla mythology. This is probably a good thing. Before I go into the content review prada handbags let me start the review of FLCL volume two by giving out some technical details rolex replica. Unlike volume one, my disc came in an Amaray plastic case. I will wager that part of the reason the volume one disc came in a colored jewel case housed in a, nevertheless handsome replica chanel, cardboard box was probably to save costs. Why the sudden change to the plastic keepcase I can't figure, but I must admit that I like it better. The cover features an illustration of the character of Mamimi and it is reddish/pink in color on white rolex replica as you can see.